Penned by Mandolinist Kevin Fabozzi after a whitewater rafting trip down the Salmon River in Idaho. Composed by Craig Hall for his beloved for their wedding day. He has arranged it here for the Society to play. 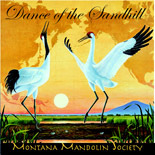 Inspired by our tour of Japan in 2002 and the actual witness of the Sandhill Crane's dance-alive and well in Duck Creek, MT.. Composed by Dennis White on the 5 string banjo and arranged for the Society by Walter Carter and Dennis White. Another composition by Dennis while driving home from a show in Northern Montana. He saw the largest full moon he had ever seen while the morning sunrise was at his back. A very surreal experience that few have ever experienced. This Ralph Towner classic arranged for the Society by multi-instrumentalist Dennis Hunt. A lovely waltz composed by David Wilkie for the MacLeod family who live at Scatwell House at Easter Ross. The solos are by cellist Kyle Brenner and violinist Sara Williams. This is one of those tunes that we've been playing for years in our live show. We decided to record this after numerous requests for that "basketball song". This jazz standard is played wonderfully by the Society's Jazz quintet. It features the mandola playing of Dennis Hunt and the guitar virtuosity of Craig Hall. This Norman Blake piece was the inspiration for our interest in multiple mandolins dating back to the 70's. It features the entire mandolin family of instruments; mandolin, mandola, mandocello, octave mandolin as well as guitar,cello, and bass. This old Shaker tune features the playing of two hammer dulcimer players that we are honored to have in the Montana Mandolin Society, Lindsay Turnquist, and Dennis Hunt. Kevin Fabozzi's mandola playing is highlighted in this rousing Cuban piece. You'll hear a versatile rhythm section with the many mandolin voices of the group. This is one of those kind of tunes that we have warmed up with or jammed with before a show. The simple Bill Frisell melody lends itself wonderfully to improvisation. Tommy Jarrell, the legendary Appalachian musician use to say that "you don't really feel the tune unless you play it for a long time". This piece has to be the music of the fife and drum played by soldiers on their way into battle. It's a known fact that Bill Monroe was influenced by the fiddle music of his Uncle Pendleton Vandiver and the guitar playing of Black Blues singer Arnold Schultz. This is what we imagine it might have sounded like.